What a handsome guy! This was made from some Tivoli that I bought when we were in Ireland years ago. This is one thick sweater! I believe he will be able to weather any storm in this. But he is quite pleased with it. 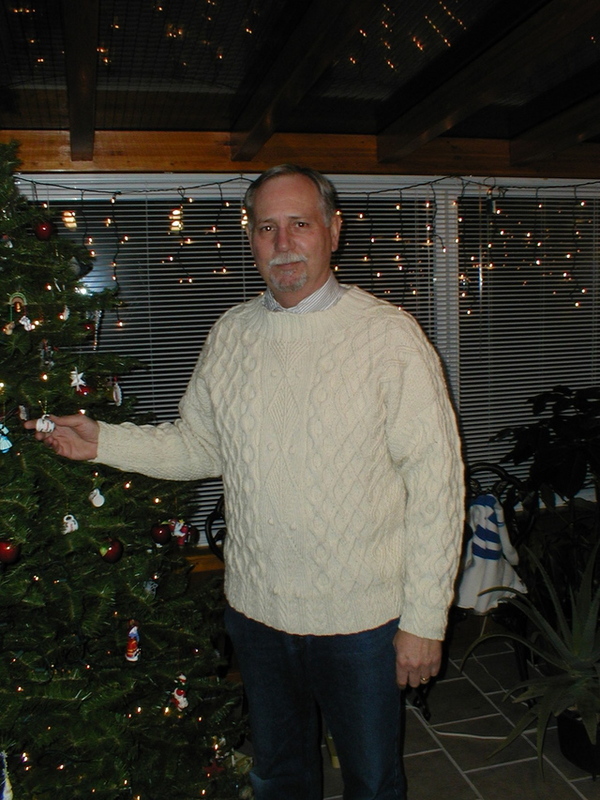 In fact, he is sitting here now in his recliner, reading and all wrapped up in his new sweater. At least until the heat kicks in. Then he’ll either have to shed it or freeze me out. I realize the picture doesn’t show the detail real well, but I can’t get it off of him to do better pics. I think one of my projects over Christmas break will be to start a photo album of my FO’s with better details. And despite my better judgement, here are pictures of Tilt on a body. I am not especially photogenic – in fact I think the one from the rear definitely shows my better side. 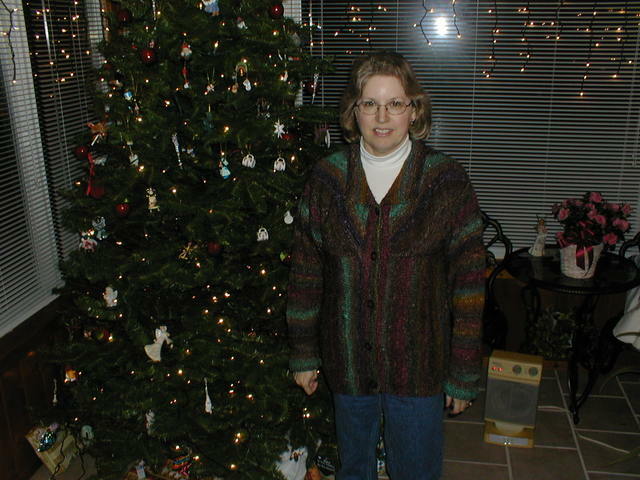 This was a fun knit, but I would not do it again. I never can get my horizontal and vertical gauge to come out comparable. Usually that doesn’t matter because you just get horizontal gauge and knit until it’s long enough. 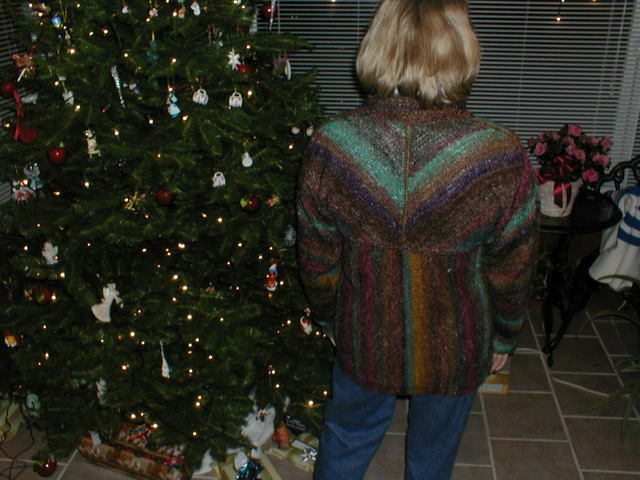 However, the yoke on this was knit on the diagonal and had some very complicated shaping, so there was no way to adjust. So the sizing was pretty dicey. And it was almost impossible to estimate the sleeve length. As you can see, the sleeves would fit a gorilla (and they’re rolled up). Despite what I may have told my sister growing up, she is not a gorilla, so I may have to undo the sleeve seam, snip and knit the garter stitch cuffs over. However, as EZ would say, I AM the master of my knitting and can do that if necessary. Now I am all freed up to do some really fun knitting! Old Shale socks, here I come! The handsome guy looks like he’s just loving that new sweater. No wonder. It’s gorgeous and looks like a perfect fit. Beautiful sweaters, both of them! I might have to go for that Aranmoor some day when I grow up. You did a marvelous job on both sweaters!! The Tilt is very unique and it does look great on you. I printed that pattern out ages ago and have been waiting to see how yours turned out before taking the plunge. I’m especially grateful for the info on the sleeve length. I have really, really short arms. I’ll probably be hounding you after the first of the year with questions. Both sweaters look beautiful! And what perfect fit!